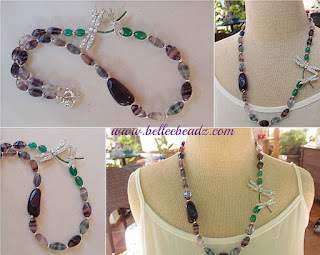 Fluorite and agate and a whopping large deep amethyst Czech bead. The rainbow fluorite stones are gorgeous in person - 16mm x 8mm - showcasing bands of green, purple and clear and they are translucent with a vitreous sheen. I've added a delightful shade of green oval agates to 'lift' the pave encrusted dragonflies on their flight. An unusual, chunk of deep purple czech bead gives this creation an interesting dimension. 56cm/22" in total length.